The Indian festival of democracy, Lok Sabha Elections 2019, are here. Campaigning is on an all-time high and the loudspeakers have gone louder. From 'Pappu' to 'Chowkidar Chor Hai', it's all happening in the battleground as India prepares for electing its next central Government and Prime Minister. At the core of all of this campaign lies the Election Commission of India and its Model Code of Conduct to be followed by political parties and candidates. From a biopic on Prime Minister Narendra Modi, to NaMo TV, a 24x7 channel of the ruling party and books and advertisements featuring the controversial Rafale Deal, all of these have come under the radar for alleged violation of Model Code of Conduct. Sexist Jibes, Name Calling Add To 'Pappu' and 'Chowkidar Chor': Politics Becomes Dirty Verbal Battleground Ahead of Lok Sabha Elections 2019. However, if one takes a closer look at the Model Code Of Conduct, it would be shocking to know the extent to which its rules are being disrespected left, right and centre. This has not been the case in Elections 2019 in particular, but a common scenario that has been seen for years. Here's taking a look at the first few points of the MCC along with some examples of what political parties and leaders have been heard saying over the past few days. The MCC is a set of norms for conduct and behaviour on the part of the political parties and candidates, in particular. The uniqueness of the MCC lies in the fact that this was a document that originated and evolved with the consensus of the political parties in 1960. Read more about the Model Code of Conduct and Its History Here. Paragraph I of the MCC is called General Conduct. Its sub-para I states, "No party or candidate shall include in any activity which may aggravate existing differences or create mutual hatred or cause tension between different castes and communities, religious or linguistic." Ironic, isn't it? Despite years of India's progress, the battle eventually boils down to religion, caste, hatred when it comes to seeking votes. The sub-para II of Paragraph I says, "Criticism of other political parties, when made, shall be confined to their policies and programme, past record and work. Parties and Candidates shall refrain from criticism of all aspects of private life, not connected with the public activities of the leaders or workers of other parties. Criticism of other parties or their workers based on unverified allegations or distortion shall be avoided." This paragraph would make one wonder if candidates even care about this regulation. Personal attacks, sexist jibes, name-calling are things India has been witnessing on a regular basis in the campaign for the Battle of 2019. From Priyanka Gandhi's saree to Smriti Irani's bindi, all these have been spoken about by politicians over the past few days. The MCC came into effect on March 10, the day when the schedule for the Lok Sabha Polls was announced by Election Commission. Since then, there have been N number of personal attacks at several political rallies as well as on the social media. Uttar Pradesh BJP MLA Surendra Narayan Singh, too, is someone who has constantly been making sexist remarks. One of his jibes came against BSP supremo Mayawati, when he said, "Mayawati ji khud roz facial karwati hain, vo kya humare neta ko kya shaukeen kahengi. Baal paka hua hai aur rangeen karwake ke aaj bhi apne aap ko Mayawati ji jawan saabit karti hain, 60 varsh umar ho gayi lekin sab baal kaale hain (Mayawati gets facial done every day, she can't cast aspersions on our leaders. She colours her hair and tries to prove herself young. She has turned 60 but her hair is all black)." Jaydeep Kawade, a leader from the People's Republican Party(PRP), an ally of the Congress, recently made an offensive personal remark against Union Minister Smriti Irani. "Smriti Irani sits beside Gadkari and talks about changing the Constitution. Let me tell you a thing about Smriti Irani. She wears a big bindi on her forehead and someone told me that when a woman changes her husbands frequently, the size of her bindi keeps growing," Kawade said. Besides the sexist jibes, there have been several personal remarks too. When PM Modi attacked the Congress over dynasty politics in his blog, Congress leader Tariq Anwar responded saying, "A person who does not have a progeny cannot take the legacy of the dynasty forward. Modi Ji does not have a successor in the family, which is why he is making such comments." Recently, BJP chief Amit Shah also made a personal remark against RLD's Ajit Singh. "Isn't Ajit Singh at an age where he should be a grandfather or a great-grandfather," Shah asked. The sub-para III of Paragraph I says, "There shall be no appeal to caste or communal feelings for securing votes. Mosques, Churches, Temples or other places of worship shall not be used as forum for election propaganda." It's difficult to think of one candidate who has not been appealing to "caste or communal feelings for securing votes." The most recent examples are those of Prime Minister Narendra Modi and Mumbai Congress chief Milind Deora. On Congress President Rahul Gandhi's decision to contest election from Kerala's Wayanad in addition to UP's Amethi, Modi said, "The Congress insulted Hindus. People have decided to punish it in the election. Leaders of that party are now scared of contesting from constituencies dominated by majority (Hindu) population." "They gave birth to the Hindu Terror phrase. They have insulted a 5,000-year-old culture. They have sinned by adding the terror tag to Hindu and now they are afraid of contesting on Hindu majority seats, that is why they are contesting from those seats where the majority is in minority," PM Modi said while addressing a public meeting in Maharashtra's Wardha on Monday. Meanwhile, Deora on Tuesday hit out at the Shiv Sena accusing the Uddhav Thackeray-led party of acting against minorities. "Shiv Sena has been against minorities. A few years ago, they insulted Jain religion by cooking meat outside Jain temples during Paryushan festival. You must remember this and teach them a lesson through your votes," Deora said. "Mosques, Churches, Temples or other places of worship shall not be used as forum for election propaganda," says the MCC. Ironically, these form the very core of campaigning. Televised visits to places of worship such as temples is a campaign highlight for candidates these days. And let's not forget that for years now, there hasn't been a single election where Ram Mandir has not been an election issue spoken about. You can read all the points of the Model Code of Conduct here. These are just two points of the MCC and the examples of how candidates are being ignorant about these are there for all to see and hear. 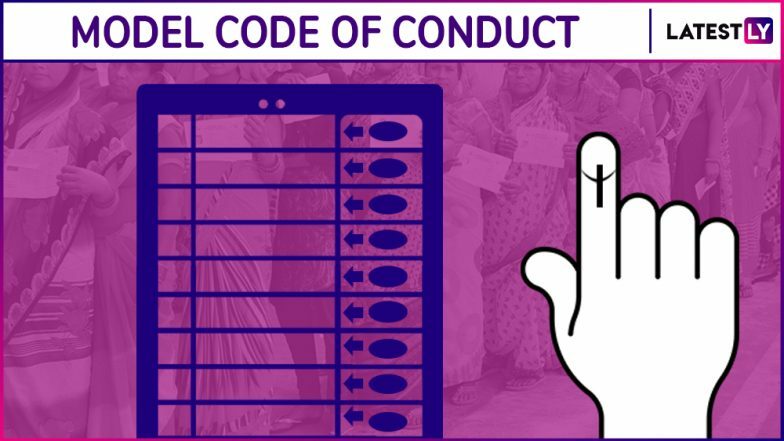 While movies, TV channels make headlines for alleged violation of the MCC, it is shocking to see how blatantly the very beginning paragraphs of the Model Code of Conduct may not be respected or rather 'ignored' by those fighting the elections and forming India's lawmakers.